Works great, no fuss and came quite quickly. This charger doesn’t work with my iphoneXR when I initially put my phone into the holder it lights up and indicates that it is charging but then after a few seconds it does it again. My phone can be in the holder for ages and not gain any charge and worse still I find my phone lighting up every 5 seconds or so very distracting while driving. Works pretty good. Could be a little sturdier. Doesnt like to charge if phone is at 20% or less. Haven't tried yet how it charges, as the wire can't reach usb hole, which is under the armrest... A bit disappointed, cause it was a gift, and it is too late to return it.. Very good product, fit perfectly for my phone and works very well. Works well, tho sometimes a little tricky to get it settled right. Charges thru my charger compatible case, and grips the phone securely. Really pleased with this. It's very good quality and constructed well. The clip that goes into the air vent has a screw thread that tightens/loosens rather than just a flimsy spring clip so I'm confident it won't drop off! The phone is gripped into place nicely with a cover on and charges efficiently! Horrible charging. Intermittent charging. When it does connect, and I'm running my GPS, it barely keeps the same power percentage. As described reasonabley priced with fast delivery who could ask for more?? Excellent fits well looks good. Excellent product fits easily onto the vent and easy to secure and remove the phone. Looks a quality product and delivered in the usual prompt fashion. 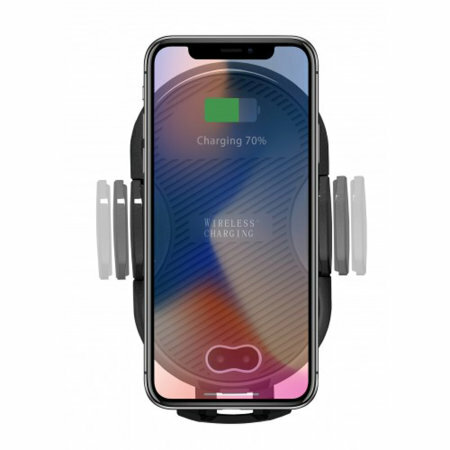 The ideal wireless charger for the car , just put the your phone in the holder and it charges straight away with waiting time plugging lead in . First thing when I got it out of the box was how big it was. It was much bigger than it looked on the web. It also sticks a fair way out from the vent when attached. It is very solid and holds the phone firmly. The charge at time struggles to power up when you have a sat nav/streaming music, but it at least holds position. It does charge up reasonably with nothing running. All in all a decent unit, good for grabbing in and out (for using the contactless pay at a drive thru for example) and very sturdy when in place. Charging is not as good as cabled in, but it takes the faff of cable out of play so that's a major plus. Good price too. Overall I would by it again. Having just got my Samsung S8+, I needed a wireless charger for my car. Previously had a top end wireless charger for my previous car, but the disc that struck to the dashboard (Charger suckered into it) would require a mini nuclear explosion to remove it from the dashboard and I didn't want that to happen to my new car, so decided to purchase the QI Universal Wireless Charging Vent holder. The price was amazing (could've bought 6 for the price of the well known make) The quality is great, was dubious at first, having not used a 'vent' holder before, but I needn't have worried. It grips the S8+ like a vice and charges the phone no problem, even when I Bluetooth music through the car stereo. I have no hesitation in recommending this product. Just wished I'd known about Mobilefun 4 years ago, I would've saved a bomb, instead of needing one to remove the disc from my car's dashboard.